Google I/O When Lars Rasmussen first floated the idea, Google co-founder Sergey Brin wasn't impressed. "He came to me and he said 'This may sound kinda crazy, but we're going to reinvent communication and we just need a bunch of engineers to go of to Australia for a while and we'll get back to you after a couple of years,'" Brin remembers. "It was not a very compelling proposal." But Brin greenlighted the project anyway. After Google acquired their Where 2 Tech startup in 2004, Lars Rasmussen and his brother Jens had spearheaded the Google Maps project, and in an extreme case of Google's much-lauded commitment to creative freedom, Brin gave the pair just what they asked for. "Lars and Jens had previously redefined what mapping was like - they already had a success under their belt - and communications was one of those trigger topics," Brin told reporters yesterday afternoon at Google's I/O developer conference in downtown San Francisco. "We decided to give them the benefit of the doubt. It was also an interesting experiment. It was one of the most autonomous development groups we've had at Google." The way Brin tells it, the decision allowed the Chocolate Factory to "innovate how we run things." But by all accounts, this amounted to letting the Rasmussens do whatever they wanted. The result - after two years of development - is Google Wave, the new-age communication and collaboration tool the company unveiled on Thursday to a standing ovation from hundreds of gathered developers. 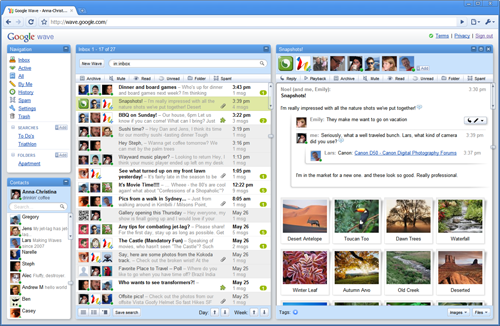 Still under construction - and available only to the developers who attended Google I/O - Google Wave is a browser-based app that crossbreeds email with IM and document sharing, allowing you to respond to email-like messages with IM-like chatter - and vice versa. And inside and among these cascading discussion threads - aka "waves" - you can drag-and-drop photos, videos, maps, documents, and more. Wave promotes a kind of "real-time interaction" that's closer to real-time than most. When you send an IM, each character appears on your buddy's screen as you're typing. And when the two of you share a document across the wire, you can edit adjacent text at the same time, eyeballing each other's changes as they happen. Some have painted Wave as a slap in the face of Microsoft's Ray Ozzie-inspired collaboration app, SharePoint Workspace. And others see it as some sort of Twitter antidote. But during a press briefing Thursday morning, Google insisted that Wave was built without competing products in mind - much less a concrete business model. With engineering projects such as Wave, Gundotra later added, "We don't think about what competitors are doing... We believe that you build for the user and the rest will follow. Part of the excitement is rethinking the problem and coming up with a fresh approach." When one reporter questioned whether he was telling the whole truth, Gundotra quickly repeated himself. And judging from Google's track record, we're inclined to believe him. At least for the moment, the company's top-secret search money machine is pulling in more than enough dough to fund such idealism. Clearly, Google wants Wave to be an open means of communication along the lines of email, and not just another addition to its very own online Apps suite. Gundotra and company are prepping a Wave comms protocol so that any other communication tool can talk to its app. They're opening up "the lion's share" of the app's client and server code, so that outside developers can build their own Wave apps. And they're publishing various Wave APIs so that world+dog can slap the app's (near) real-time conversations onto blogs, wikis, and other webpages. "We think of email as a successful open protocol," Lars Rasmussen explained. "But we think that with the advances in computers and all the experiences that have been made with different types of communication, [the world] can do better. Google Wave is our suggestion." How very Googly. Two guys asked if they could replace email. Sergey like them, so he said yes. They went off and built something. And now, the company has tossed it against the interwebs to see if it sticks. As the company rolled out the developer preview at Google I/O, you almost got the impression it was a last-minute decision. Gundotra pitched Google Wave as the spearhead of the company's efforts to revolutionize browser apps using HTML 5. Coded in Google Web Toolkit, the app leans heavily on the still-gestating standard. "This is an unbelievable demonstration of what is possible in the browser," Gundotra said just before Lars Rasmussen's demo. "You will forget you are looking at a browser. I want you to repeat after me 'I am looking at an HTML 5 app. I am looking at what is possible in the browser itself.'" Apparently, Sergey Brin needed much the same talking to. According to Adam Schuck, one of the Wave's early developers, when the team first gave Brin a demo, the Google co-founder said "It's cool you're coding in Flash."